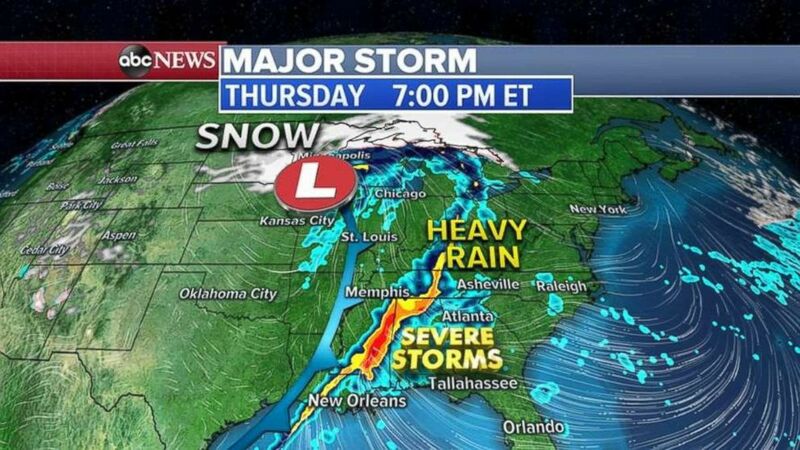 The same storm that diverted dozens of flights and cancelled hundreds more between Texas and Minnesota Wednesday was moving east, bringing severe rain storms to the Southeast and snow to the northern Great Lakes. On Thursday, more than 300 flights were cancelled in Dallas, planes were parked on the tarmac in Chicago for more than an hour and nearly a quarter of all flights in Houston were delayed. Severe storms will move through Louisiana, Mississippi and Alabama by 7 p.m. on Thursday. The storm stretched from the Canadian border all the way down to the Mexican border, ABC News meteorologist Max Golembo reported. There were blizzard-like conditions from Kansas to Minnesota and strong storms with heavy rain from Texas to Illinois. Heavy rainfall will create the possibility of flash flooding between New Orleans and Atlanta with damaging winds possible through the Southeast. The rain, and snow to the north, will move into the Ohio Valley and reach north to New England overnight Thursday into Friday morning. Rain isn't always problematic, but lightning and wind can snarl airport traffic for extended periods of time. Dallas Love Field suspended operations for a brief period on Wednesday when lightning was striking near the airport. 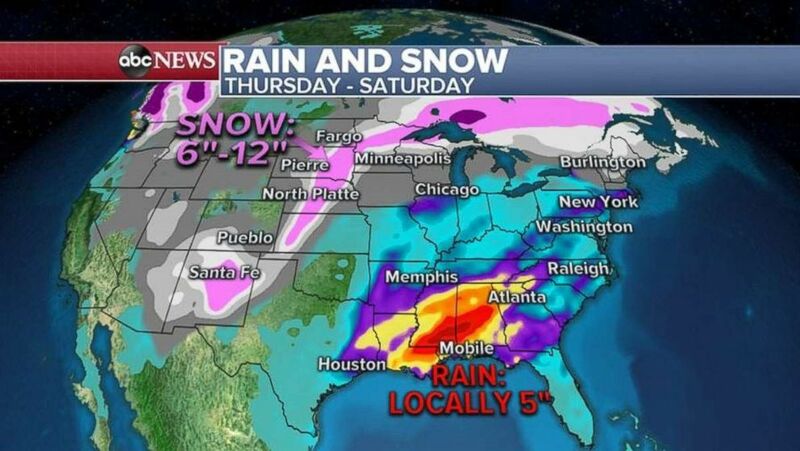 As much as 5 inches of rain are possible along the central Gulf Coast, while as much as 1 foot of snow could fall in the northern U.S. over the next three days. Heavy rain is likely along the Interstate 95 corridor from Boston down to Washington on Friday, with snow further to the north. 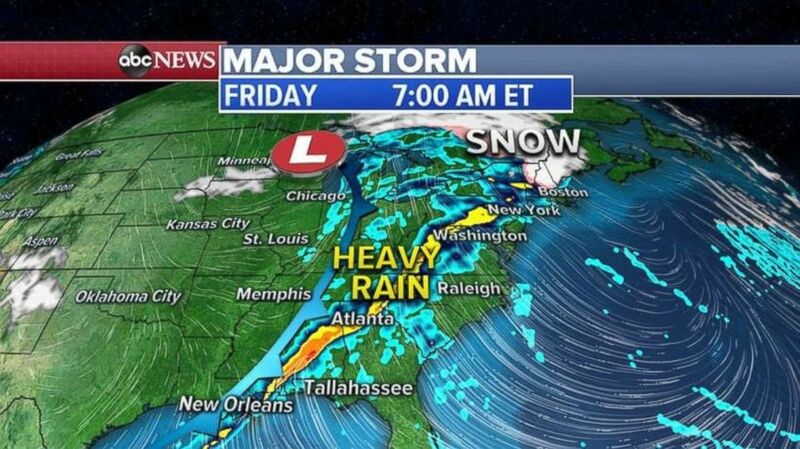 None of the major U.S. carriers anticipated widespread cancellations, but officials said delays could plague the Southeast and some of the East Coast on Thursday and Friday.